It is generally recognised, research house Roy Morgan notes, that Australia’s level of compulsory superannuation contribution – 9.5% of income – will not on its own provide in retirement for most workers to be self-funded. Additional contributions are required. 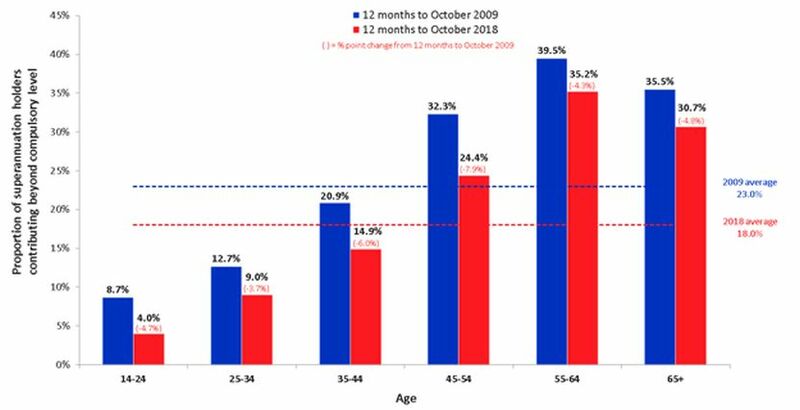 After having conducted face-to-face at-home interviews with 50,000 Australians each year, including 23,000 with super, Roy Morgan has found that in the twelve months to October only 18% of those interviewed are currently contributing beyond 9.5%. That figure in 2009 was 23%. On a gender split, that’s 18.0% of men and 18.1% of women in 2018. In 2009, 24.5% of men and 21.1% of women were making additional contributions. Both are lower, and women are now outpacing men. Older workers, unsurprisingly, comprise the bulk of those ramping up contributions, with retirement looming. The greatest contributors are the 55-64 age bracket, of which 35.2% over-contribute. This compares with 24.4% for the 45-54 bracket. Beyond retirement age the figure falls again, with 30.7% of 65+ year-olds over-contributing. Among younger workers, the numbers dwindle, again not so surprisingly. For the 35-44s it’s 14.9%, for the 25-34s it’s 9.0%, and for the 14-24s it’s 4.0%. But of greatest concern is the rate at which those numbers are dropping. Since 2009, the number of 35-44s over-contributing has dropped by 6.0 percentage points. For the 45-54s it’s 7.9 percentage points. “In addition to the problem relating to the low level of additional contributions, there is the adverse trend that less workers across all age groups are now making additional contributions compared to nine years ago. One of the reasons for this decline is the difficulty of engaging workers in what for most has a very long term time horizon and as a result is likely to involve many rule changes. It has long been an issue for Australians that successive new governments, and boy haven’t we had a few lately, will yet again move the goal posts on super investors and completely upset retirement strategies. A case in point will be whether or not Labor will win next year and whether or not it will remove franking credits paid as cash-backs, for example. In 2009 Australians were reeling from the GFC, many having seen retirement savings invested in the stock market halved. Subsequent low interest rates drove the housing investment boom, and pushed up mortgage commitments for average families. Power bills have risen exponentially in the interim. And as Norman Morris duly noted, in the wake of the bank Royal Commission, why would you trust additional funds to that lot? It’s a tough call for Australians to have to take additional funds out of the household budget and use them to top up super. But the population is ageing, meaning an ever-increasing draw on the government’s pension pool.